We would like to apologize for the lack of English information on this website. However, a brief summary of the most important details about Landschapslumen (‘Luminescent Landscape’) is provided below. Landschapslumen consists of audiovisual installations, in which multiple projectors are used to render a surreal video world on top of natural or industrial landscapes. These projections are spread throughout the landscape to fully immerse the visitors in a fantasy world. We want to surprise our visitors by letting them ‘discover’ the images in the landscape themselves. Familiar places gain new meanings, the landscape yields new stories. Part of the video footage is shot on the actual location, while other parts are filmed or animated at the studio. Combined, these form the visual element of the installation. The video is supported by a soundscape, featuring sounds drawn from the location, which creates an all-embracing experience. The first version of Landschapslumen was called Zandlumen (‘Luminescent Sand’) and was shown at the Dutch Oerol Theatre Festival 2010. Following a successful try-out year, the installation returned to the 2011 edition of the festival in a large-scale version with a soundscape and 14 beamers projecting onto the sand dunes near the sea. During the same year, Boslumen (‘Luminescent Forest’) was presented at Into The Great Wide Open Festival. 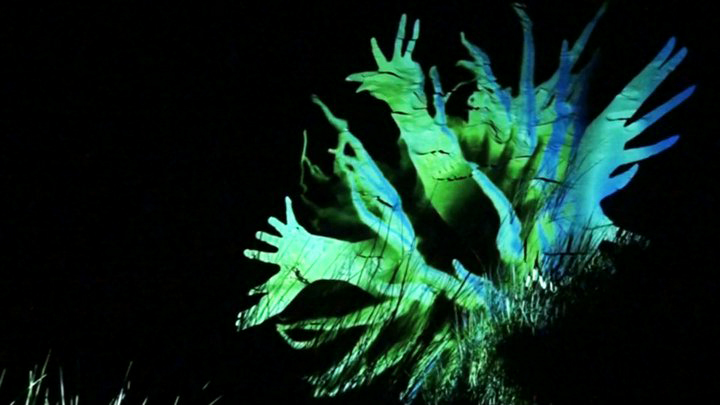 Using multiple projections onto the trees, a forest clearing was transformed into a surreal place. After these two performances, various versions of the project were shown to other audiences. Much more could be said about Landschapslumen, but we would like to encourage you to explore the photos and videos on this website to gain a better understanding of the project. Landschapslumen is created by Julian van Buul and Vincent Vriens. Both of us are working in the field of video and audiovisual media. We work in collaboration with audio designer Joost van Dijk and several other animators, designers and producers.